Here Are Some Big Cat Jokes To Enjoy. Please E-Mail Me At The Address At The Bottom Of The Page. Thank`s ! Q: Why does a lion kneel before it springs? 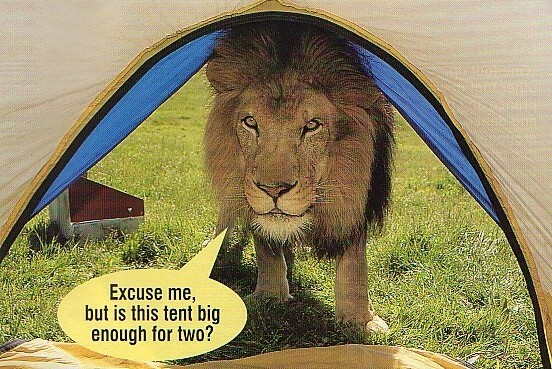 Q: Where does a lion sleep? A: Anywhere he wants to! 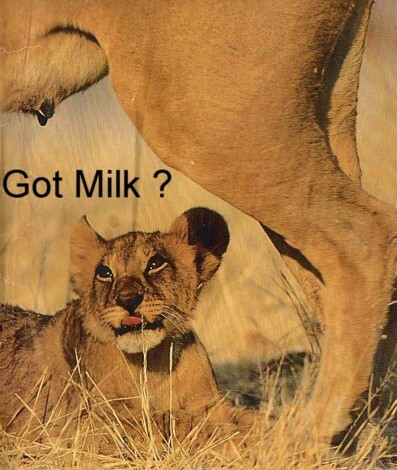 Q: What did the lioness say to the cub chasing a hunter? A: Stop playing with your food! 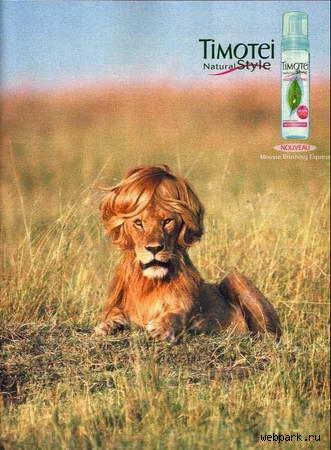 Q: What do you call a lion wearing a cravat and a flower in it`s mane? Q: Why was the lion-tamer fined? A: He parked on a yellow lion! Q: What do you call a show full of lions? 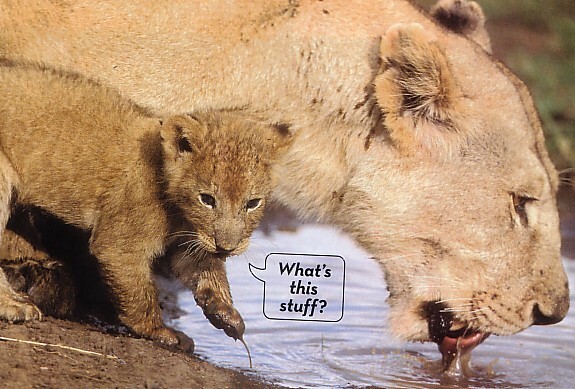 Q: Why does a lion have a tail tuft on his tail? Q: Why are lions religious? A: Because they prey frequently, and prey as a family! Q: Why did the lions eat the preacher? A: Because he told them that they must put away their pride! Q: Who helps older lions to cross the street? 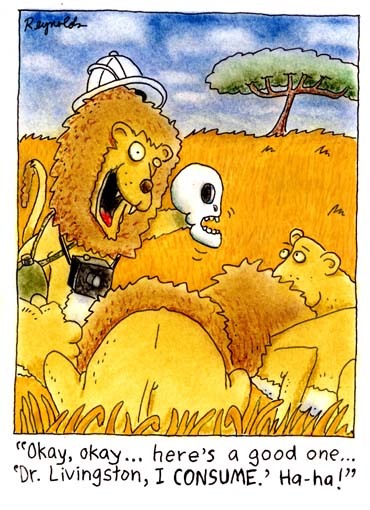 Q: Where do lions live? Q: What should you know if you want to be a lion tamer? A: More then the lion. Q: What was the name of the film about a killer lion that swam underwater? 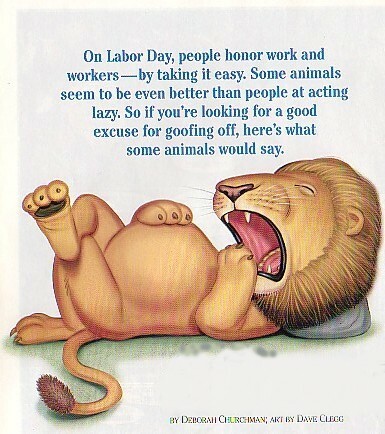 Q: What job does a lion do at a newspaper? Let the lion catch you. For every action there is an equal and opposite reaction. Implies you have caught the lion (Assuming that you're alive). 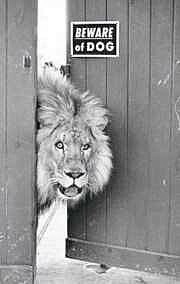 At any given moment, there is a positive probability that the lion should be in the cage. So set the trap, sit down, and wait. We place a spherical cage in the forest and enter it. 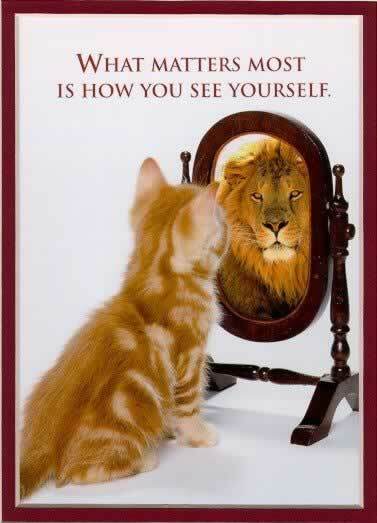 Perform an inverse transformation with respect to lion. Lion's in and we are out! We construct a semi-permeable membrane which allows everything to pass through it in it except the lions. Then sweep the entire forest with it. Integrate the forest over the entire the area. The lion is somewhere in the result. So differentiate the result PARTIALLY w.r.t. the lion to trace out the lion. Don't try. You'll get caught by the lion. Two lions escaped from a zoo near Washington, D.C., and took off in separate directions. Weeks later they ran into each other in the middle of the night. "I'm having a terrible time getting food," the first lion said. "How have you been getting along? "Just fine," the second lion said. "I found a good hiding place in the Pentagon. I eat one general a week. It'll be years before they notice that anyone is missing!" A big-game hunter went on safari with his wife and mother-in-law. One evening, while deep in the jungle, the Mrs. awoke to find her mother gone. Rushing to her husband, she insisted on them both trying to find her mother. The wife said, ''What are we going to do?" Q: What do you get if you cross a tiger with a snowman? Q: What flies around your light at night and can bite your head off? Q: Whats striped and bouncy? Q: Whats the difference between a tiger and a lion? A: The tiger has the mane part missing! Q: How are tiger`s like sergeants in the army? 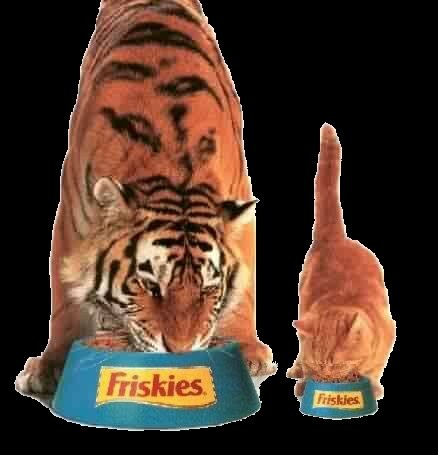 Q: On what day do tiger`s eat? Q: If a four legged animal is a quadruped and a two legged animal is a biped,what is a tiger? Q: What do you call a tiger that likes to dig in the sand? 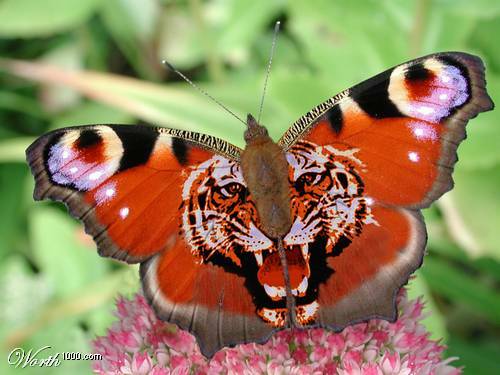 Q: How do tigers describe themselves? Q: What do tigers sing at Christmas? Q: Who went into the tiger`s lair and came out alive? Q: Why shouldn`t you grad a tiger by his tail? Scientists say they have discovered a tiger breed they didn't know existed. It has no sharp teeth or claws, no way of protecting itself - it's called the Cincinnati Bengal Tiger. The dog thinks, "Oh Damn, "Uh-oh, now I'm in trouble!". (He was an Irish Setter)..... Then he noticed some bones on the ground close by, and immediately settles down to chew on the bones with his back to the approaching cat. Just as the leopard is about to leap, the dog exclaims loudly, that was one delicious leopard. I wonder if there are any more around here?" Hearing this the leopard halts his attack in mid stride, as a look of terror comes over him, and slinks away into the trees. "Whew", says the leopard, "That was close. That dog nearly had me." Meanwhile, a monkey who had been watching the whole scene from a nearby tree, figures he can put this knowledge to good use and trade it for protection from the leopard. So, off he goes. But the dog saw him heading after the leopard with great speed, and figured that something must be up. (Irish paranoia) The monkey soon catches up with the leopard, spills the beans and strikes a deal for himself with the leopard. The leopard is furious at being made a fool of and says, "Here monkey, hop on my back and see what's going to happen to that conniving canine." Now the dog sees the leopard coming with the monkey on his back, and thinks "What the hell am I going to do now?" But instead of running, the dog sits down with his back to his attackers pretending he hasn't seen them yet. And just when they get close enough to hear, the dog says, "Where's that damn monkey. I just can never trust him. I sent him off half an hour ago to bring me another leopard, and he's still not back!!" Q: What do leopards say after lunch? A: That sure hit the spots! Q: What's spotted and bouncy? 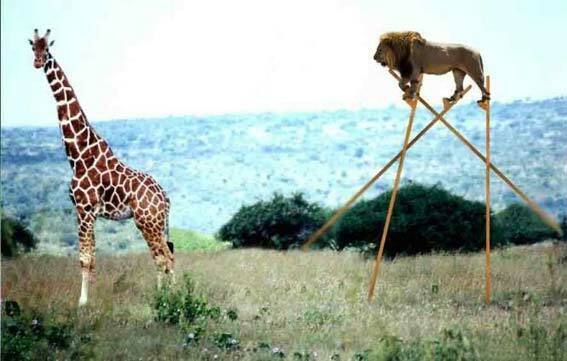 Q: Why can`t a leopard hide? A: Because he`s always spotted! Q: Why wouldn't the leopard take a bath? A: He didn't want to get spotlessly clean! Q: On What side does a leopard have the most spots? Q: What did the one leopard say to the other leopard deep in the Jungle? Q: Why didn't the leopard go on vacation? A: It couldn't find the right spot! Q: How does a leopard change its spots ? A: When it gets tired of one spot it just moves to another! Q: What kind of cat shouldn`t you play cards with? Q: What animal gets the most bad grades in school? Q: What do you get when you cross a cheetah an a hamburger? 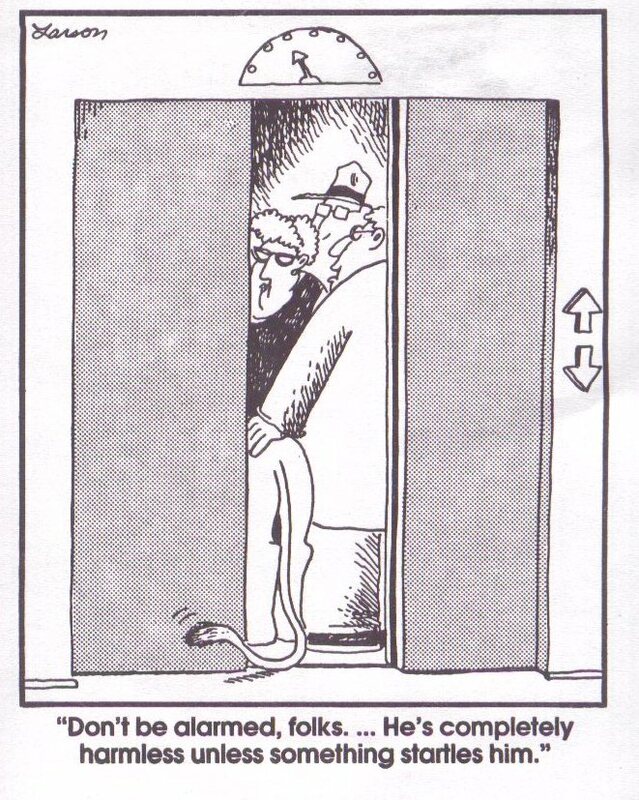 Lazy Lion Lion Comic Elevator Lion Got Milk?